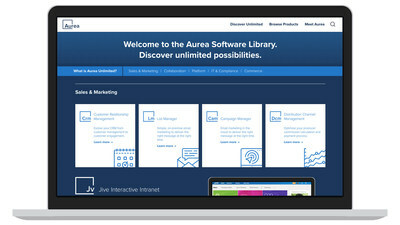 AUSTIN, Texas, March 19, 2019 /PRNewswire/ -- Aurea, a family of companies that help global businesses accelerate digital transformation, announced its new business model offering the world's first unlimited enterprise software library. The company's unique approach creates value by entitling all customers to use every product in Aurea's portfolio for a single annual fee. By reimagining the way enterprise software works, Aurea Unlimited is helping businesses simplify and advance their use of technology to innovate with less risk. In addition, the company today expanded its library with new products from its portfolio, including Infer for predictive marketing intelligence and First Rain for sales analytics. "Our customers' capacity to drive change and competitive advantage should only be metered by their aspirations – not their technology budgets. That's why we're on a mission to reinvent enterprise software, and we're betting our business on the concept of unlimited possibility," said Scott Brighton, CEO of Aurea. "Just as we all enjoy unfettered access to great content with consumer offerings like Netflix and Spotify, th ever-growing Aurea Unlimited software library opens up the same kind of access for business and IT leaders, so they can quickly, efficiently and cost-effectively add value to their company's digital transformation strategy."